I know what a lot of my friends, especially those in Alaska, are thinking — "Oh, it's so sad, she's stuck in California. You have to drive everywhere out there. There's all those restrictions on open space. There's people on the trails. We like to gripe about our six months of winter, but at least we have winter. She's probably going to cry when December comes and it's still 60 degrees outside." That last part is probably true. But I am actually a very adaptable person. I weather change well, and get better at it with every major life upheaval. I have every intention to survive and even thrive in California. I have a plan. Firstly and most importantly: Plans for adventures. Beat and I both function best with big challenges on the horizon. He's got a lot of big challenges planned for 2011, and I'll be lucky enough to join in on some of them while developing my own new experiences. 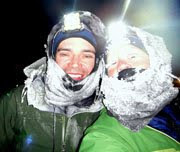 First off of course is the White Mountains 100 on March 27 in Fairbanks. This is an incredible scenic loop through a fairly remote Alaska mountain range, with more than 8,000 feet of climbing in 100 miles of snowmobile trails, in temperatures that will likely range from 25 above zero to 25 below during the race. Beat has decided he wants to avenge the Susitna 100 by improving his sled design and completing the WM100 on foot. I of course wouldn't miss Fairbanks' fantastic snow-biking for the world, and Beat's switch-up means I'll get to ride his Fatback! Hooray! In April, Beat's signed up for the Santa Barbara Endurance Race. It's 100-miles of tough trail running with a reported 35,000 feet of climbing. There's a chance I'll be in good enough condition to keep up with him as a pacer for a short portion of this race. Depends if I can improve several aspects of my running in a few short weeks. I intend to work on this. In May, several of my Banff friends are riding the Mah Dah Hey Trail as a mountain bike tour. I'd love to join them, write an article for Adventure Cyclist, and perhaps see a few Montana friends and haunts in the process. This dream is TBD, because North Dakota is a long way from California, and Beat probably can't swing the time off. In June, Beat's signed up for the San Diego 100. Another fun road trip south. I'm hoping I can go visit my sister in Huntington Beach for at least one of these weekend ventures. I'd also love to travel to Juneau for a summer visit. This is something I've been promising friends there since last summer, but I'm unsure whether I'll be able to swing it, and a Juneau trip is very TBD. There's also the ulterior motive that I'd love a chance to swing up to Whitehorse for the 24 Hours of Light. I really want to enter at least one solo 24-hour mountain bike race this season. For reasons I'll explain next, the timing is bad for the 24HOL. However, everyone knows that 24HOL isn't a race, anyway. It's a Yukon mountain bike festival where you get to binge on biking to your heart's content. It shouldn't be a setback at all. I can't afford any late-June setbacks, because in mid-July, I'm signed up for my first 100-mile trail run, the Tahoe Rim Trail 100. This is a big deal to me. I want to nail it. I know the Susitna 100 counts as my "first" 100-mile foot race, but I still believe Alaska snow expeditions and summer mountain trail running are different sports, requiring different skills, and I have lots of work to do to get in shape for this rocky, climby, higher-elevation run around Lake Tahoe. It's intimidating, but I'm excited for the challenge and the training. August brings the Capitol Forest 100, a 100-mile mountain bike race in Washington. Beat and I are both planning to ride it, and unlike the WM100 there is no running option, so I guess he's going to have to buckle down and ride. Beat's already a much faster mountain biker than me, so I'm guessing by August we'll be raring to "race" each other rather than hang back together. In September, Beat's going back to the Tor des Geants, crazy man. This means while he trudges 200 miles and 80,000 feet of climbing through the rugged and pain-inducing Italian Alps, I get to support him by drinking cappuccinos in village cafes and hiking all day in these incredible mountains! Hooray! In November comes to big crescendo for the year, a trip to the Himalaya with Racing the Planet in Nepal. It's a stage race, TransRockies style, but on foot and much more self-supported. You carry all of your food and gear for a week-long run across 250 kilometers of incredible high country. Basically, it's a fast-pack trip, but Racing the Planet does a lot of the groundwork to design a network of trails that outsiders seldom have the opportunity to visit. Since I've never even been outside of North America (Hawaii excepted), I'm very excited for the prospect of visiting both Europe and Nepal in the same year. Career. It's obvious to most of my friends and family now that I'm not really a career-minded person. I value hard work and productivity, but I've never chosen to climb the career ladder at the expense of the aspects of life I value most: The outdoors, exercise, travel, friends, relationships, family, the pursuit of the sublime, experiencing all sides of life, and giving a voice to those experiences. In the past decade, I worked hard and lived sparsely enough to develop a fair amount of self-sufficiency, and always wanted to take time off to write, really write — not just doodle away on my blog, which is a fantastic outlet but shallow in many ways. Last April, I pursued that dream by moving to Anchorage and setting up my "writing shop," but I struggled. I didn't struggle because I didn't find instant success, which I'm not even seeking — yet. No, I struggled because I lacked self-discipline. I rode my bike all day. I started working on my writing projects, only to burn out after a couple hours and recruit a friend for a four-day trip to Denali instead. When given perfect freedom, I can be a fantastically lazy person (in my own activity-motivated way.) I got scared of nothingness, and instead sought out a structured work environment to reign myself in. I applied for a job. I moved to Montana. I don't regret it, but often I wonder if I really gave myself a chance. I love writing. Observing life and giving a voice to my experiences is who I am. I sincerely believe that if I were forced to give up bicycling, hiking, running, even going into the wilderness, that I could probably adapt, and go on living a rich and full life all the same. But if I somehow couldn't share anymore, couldn't write, the sun probably would cease to rise. I would no longer be me. Simple and plain. So this is my long way of saying that I'm going to go back to pursuing the dream I left behind in Anchorage. I have a few ideas, a few plans. I am going to finish my Tour Divide book. Last December, editor Diana Miller gave my first draft a thorough and thoughtful edit that I can really spend some time with, to develop that story in the best way I can. And it really is a worthwhile story, worth sharing, that I need to get out in the world. I've been dragging my feet on it for more than a year, and at this rate it will rot in a drawer, which I really don't want to happen. I have some new "book" ideas that I want to develop, see where they go. I have a few freelance relationships that I developed last spring that I can pursue, and I have several article, blog and column opportunities with Adventure Cyclist that remain. I also hope to develop what would be the more lucrative career path — layout and design, for both hard-copy materials and e-publications. In the newspaper biz, this is where I shined — as a fast-working (and award-winning) graphic designer. I feel that I have a lot to offer small businesses, nonprofits, and outdoor-related companies in this regard, because I can develop content as well. Maybe I can even land some contract work for special projects at local newspapers (do they have those in big-city California?) That would be a dream. It also could be a massive failure, but I doubt I will ever regret trying. I'm lucky to still have few obligations, a fair amount of self-sufficiency for the time being, support from Beat, and of course Google's awesome health insurance plan. As long as I can avoid the urge to ride my mountain bike all day, I feel I have a productive year in front of me. Whew, long post! This is more for me than any of this blog's readers. It feels good to lay out the plan on screen. OK, back to work. Look away from the mountain bike, Jill. Look away. I'm amazed by the amount of experiences you've been able to cram into your life. You are absolutely right to be doing it now, while your responsibilities are basically for yourself. I hope it all works out wonderfully for you, though even if it doesn't, I'm quite sure that you'll turn any and all lemons into some fantastic stories for us. Sounds wonderful! I was wondering if the move would give you an opportunity to work on the book. I need to read it again and give you culling edits! I'm going to Boston this weekend, so some long bus time might be just what I need. Exciting! Love the plan. Go get 'em Jill...with your writing skills, success is only a matter of time. And the TRT 100 will be fabulous. Exciting! Also, the sun out there is beautiful! Send me some, please! AHEM,I did not see Backpack the JMT with my bloggy friend Mary in 2012 on your list. Alas, you would probably want to RUN it. Anyway, you are doing what I would love to do (take time to write) but can't (mortgage). So go for it. Indeed, Mary. The JMT is definitely on the bucket list. Keep me updated on your plans as they form. And congrats on your recent engagement! I'm happy for you, and look forward to reading about your continuing wilderness adventures. True wilderness is tough to come by in western California. If you don't go to ND in May maybe that would be a good time for me to visit and we could do a short fastpacking trip somewhere. This post made me all sorts of happy for all sorts of selfish reasons. Even more adventures for me to read about! A new book!! Photos of sunshine to lift my spirits on a dreary Seattle day!!! I am continually impressed with your ability to seek out adventure wherever you go and to not let a single sunset go to waste. It's very motivating for a lethargic weekend warrior like me. Thanks, now I have Built to Spill stuck in my head! I love the writing plan too, and with all of your experiences, it seems like you have many more books in you. You're more inspiring than you know, keep it up. Sounds like an excellent year! Can't wait to hear about it. I love that you and Beat are doing this together, so happy for you both. I'm very excited about your book news. We have all been waiting for it, can't wait to read it! It was not that long ago that you were blue and contemplating a move from Juneau, were burned out with work, no beau, and considering taking a chance on a free lance writing career. I had total faith that you could and would switch things up with an extremely rewarding path and also that you would find true love. This post makes me think "I told me so!" and it makes me very, very happy for you Jill. Ditto what AucillaSinks said. It's cool to be a small part of your story and I am so stoked for your upcoming adventures. Both in life and in "adventure" adventures. Geeez, you can tell I'm not the writer. It's shaping up to be a helluva' year! You are an excellent writer. I have no doubt you will find success, however you define it. All the best. Did I miss the post about you getting hitched or does Google offer insurance to 'partners' as well? You have a better and more exciting plan than most of us.. Best of luck implementing it! So much amazing stuff Jill! And ditto AucillaSinks. would love to see you for 24HOL but that event isn't going anywhere and there's always 2012. Probably none of my business, but how'd you get on somebody else's medical plan like that? 'Domestic partner'? Hey Jill...having lived in So.Cal I would never go back but No.Cal is sooo much nicer!! heading to Nepal in two weeks to hike up to Base camp but thought you (two) would like to know of a run ~only 65km taking place while I'm on trail. Awesome post - thanks for writing it!